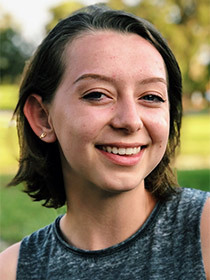 Camryn “Cami” Herr recently graduated across the river at Howard W. Blake school of the arts and is taking a gap year before she heads out to LA to pursue a Special Effects makeup career. She is co-owner of Beauty, Scars & Latex, a fun SFX makeup group you can find on YouTube. This is Cami’s second time working for Jobsite as their makeup artist. You may have seen her work in 2016’s Time Stands Still. Cami is also the Straz Center’s Social Media Correspondent which you can see @strazcenter on Instagram, alongside her best friend Rylee Cherry. She’d like to thank David Jenkins for being so rad and for the continuous makeup opportunities, as well as God, her friends and family for their constant love and support.